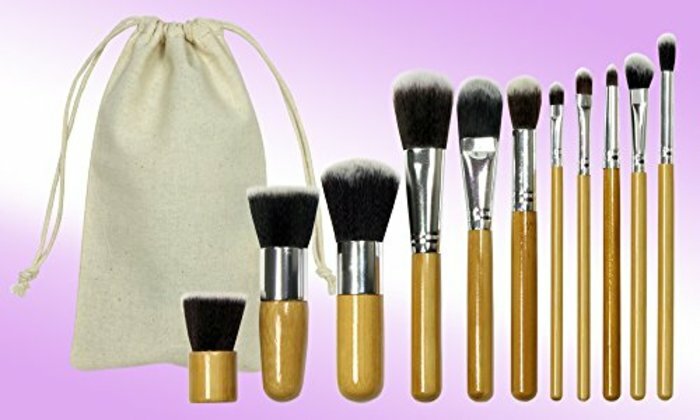 11 piece essential makeup brushes for the face and eyes - Create a complete look from base to finish with this set!Perfect for applying compact or loose powder, blusher, concealer, eyeliner, eye Shadow, cream & liquid foundation. Made of synthetic brush hair for high quality, full elasticity & dense feeling allow your make up to go with ease,super soft brushes for easy, effective & irritation free make-up application.Solid, eco-friendly bamboo handles shaped for ultimate control and perfecting makeup application techniques.No irritation to your skin,safe and comfortable to use. Our beauty cosmetic 11Pcs bamboo brush set gives flawless foundation application every single time. Put makeup on like a pro - evenly distributes makeup so no areas with too much or too little coverage. if used daily,we recommend washing your sponge frequently with a mild cleanser and air dry. We pick the brush in each Packaging individually,with a protective portable drawstring bag,you could use it as a necessory travel bag or casual use bag, it can also store your daily purse or other little things. A professional quality brush set which includes all the basics you need for daily applications,suitable for professional use or Home use.